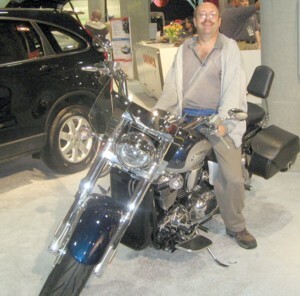 Suddenly you awaken from your reverie to remember that the bike in whose saddle you have been sitting, going nowhere, is a 2007 model Honda VTX1800 MOTORCYCLE at the Quality of Life Expo. The Official Car and Motorcycle had space next to the Official Bank, and there was even a make-up booth, and one selling kitchen knives. One of the great pleasures of the day was being able to hang out for a few minutes, and have my picture taken, with a very famous celebrity. I got to meet McGruff the Crime Dog!! The famous "Take a Bite Out of Crime" Officer of the Law himself! McGruff was there as a representative of the National Crime Prention Council ( Search the word Bicycle, on the site, for some interesting results. 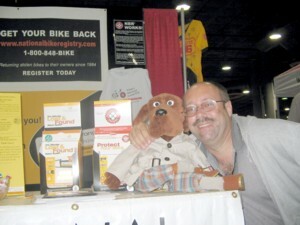 ), in support of Boomerangit, and the National Bike Registry, the Official Bicycle Registration, and Recovery Service, of McGruff himself. Needless to say I bought the Protect Your Bike Kit, and a T-Shirt, and plan to Blog about all 3 sites in the future.